on the woodside. : *six minutes of separation. I know I won't be the first to post this. But find the time to watch it. These are the words behind my silent scream. The ones that fill my chest to bursting and seriously challenge my hate moratorium. "This isn't about yelling and this isn't about politics and this isn't really just about Prop 8 ... This vote is horrible. HORRIBLE." Luckily, the antidote to hate is love. I am married in my heart. Like all pioneers, I will wait for the world to catch up. History will be the greatest judge. Waiting is not what I am here for, I live for the privilege of today. 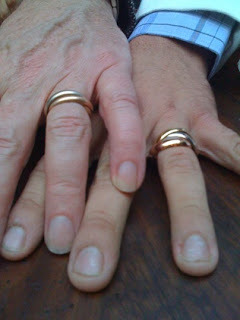 I am married, the world just doesn't know it or care...or not enough. The countless people throughout history who were never allowed to be with or live with the ones they loved. I also live for you. Their wait for history to catch up with them was not soon enough. They lived and died without their deserved dignity. When will they be honored? I could not imagine a world without what I have now. The love that dare not speak it's name. Oh history, come quickly for we are all here waiting. That was so well said. I have to forward this to everyone I know. Thank you for sharing. Damn, I can't watch the video. Stupid work. JB, great comment. Let's see a post like that on your blog! ode to a lamb chop? today is 11 11 though!! Our 2 year anniversary with 11!!! look at 11bonita when you get time! !